From "This Little Light of Mine to Ring of Fire" We Kids Rock makes Children's music that the whole family can enjoy. Check out our classes, Cds and Performances and together We Kids will Rock! We Kids Rock's Family Classes are 45 minutes of music participation for ages birth-five years old and their caregivers. One teacher plays guitar (and the other leads) as we sing, clap, shake egg shakers and most of all, HAVE FUN!! A great introduction to music for little “rockers” everywhere. Choose a class time and Location that you can attend weekly. Siblings under 8 months are free! Ages 3-5 & 6-7yr classes. This is a fun introduction to the guitar for Kids of all ages. Classes will run 5-8 weeks (depending on the location), each class being 30 minutes long and will have no more than 6 children. 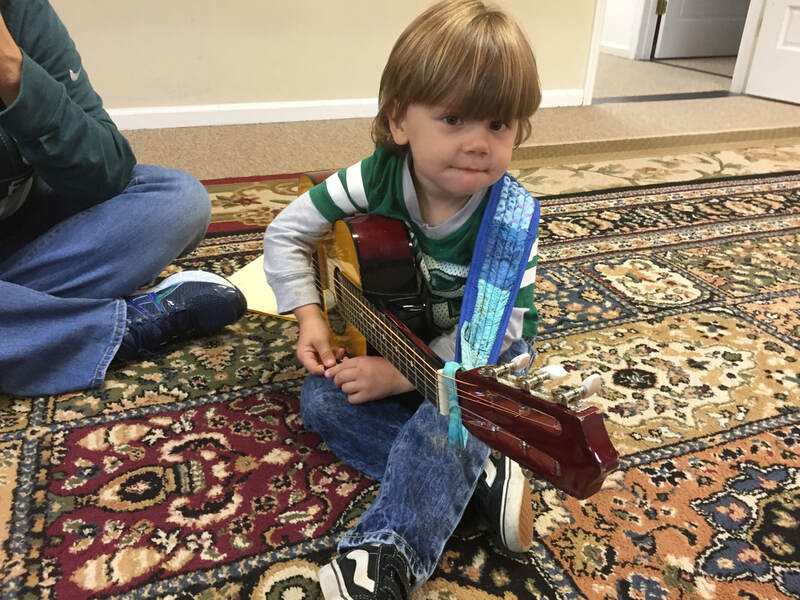 Classes will be designed to transition students from the guitar as a toy to a musical instrument while keeping their interest and enthusiasm at the same time. Put the “GUITAR” back in “Guitar Hero”!! Get them closer to the stage with a class that let’s them play as well as Learn. Parents and siblings are encouraged to stay for the class. Between January 2007 and June 2016 We Kids Rock has released six CDs “Everybody Clap Your Hands” in 2007,“Let The Sun Shine” in ’08 , “There’s A Train…” in April of ’09 and "5 Songs About Stink Bugs..." in 2011. 2014 under "Bill Currier and the We Kids Rock Band" WKR released it's 5th CD, "Old Macdonald Family Band". 2016, We Kids Rock's 4 song EP featuring classroom favorite "Don't Touch The Guitar" All six CDs feature catchy originals as well as traditional favorites in the style of early Rock ’n’ Roll, Rhythm & Blues, Punk, Ska and Country. In 2008 “Let the Sun Shine” won a NAPPA Honors award for Children’s Audio. "There's A Train", 2009 winner of NAPPA Gold and Parent's Choice Awards. "Old MacDonald Family Band" 2014 winner of a Parents' Choice Award!